Win Win Lottery W 470 Result 23.7.2018, win win lottery result 23.07.2018, Kerala Lottery Result Today 23-7-2018, win win lottery result 23-07-2018, Kerala Lottery result 23-7-2018, Win Win lottery live result Today W 470, Kerala Lottery Result 23.7.2018, Lottery Guessing Numbers, Win Win Bhagyakuri result July 23, Kerala Win Win Monday Lottery Result, win-win W 470 Lottery Draw Result, Win Win Lottery Result W470, WIN WIN Lottery W 470 result 23/07/2018. win win lottery result Draw No. W 470 held at SREE CHITHRA HOME AUDITORIUM, PAZHAVANGADI, EAST FORT, THIRUVANANTHAPURAM. 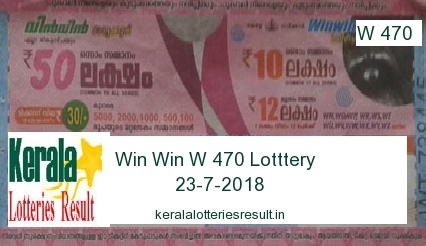 Win Win Lottery Resultof Kerala state lotteries weekly lottery W 470th draw held on 23/07/2018 (23rd July 2018, Monday) are declared. The WIN WIN lottery results with all details like agents commission, Lottery winner numbers, Win Win Lottery first prize winner, second prize, third prize etc are listed below here. Those who are taken the Kerala Government Lottery, win win W 470 Lottery can check their result of win-win lottery result today. win win lottery result 23.7.2018 : Win Win lottery is a weekly lottery conducted by Kerala State Government on every Monday. Kerala Lottery win win result and all other Kerala lotteries results are publishing on www.keralalotteriesresult.in after the official declaration of the results. Kerala win win lottery winners getting a 1st prize of Rs 6,500,000/- and 2nd prize of Rs 1000,000/- for one winner and 3rd prize is Rs 100,000 and lot of other prizes are given as per Win WIn Lottery prize structure. WIN WIN Lottery Result draw published on every Monday after 4:00 PM.